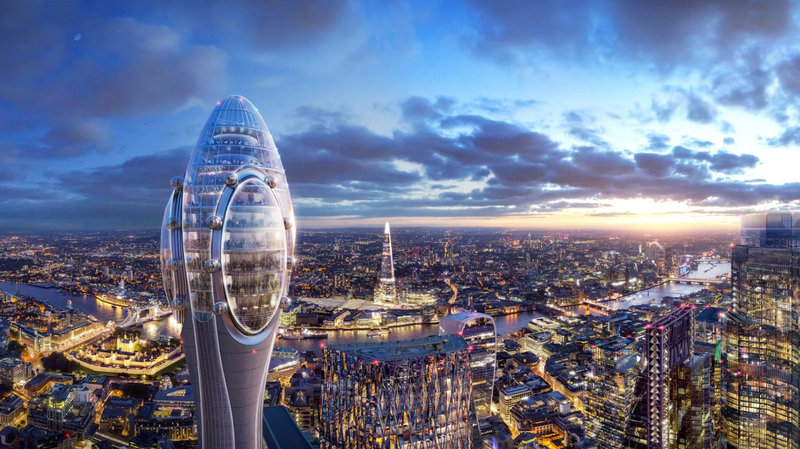 Backed by a billionaire, architects Foster + Partners have submitted plans for a “Tulip” tower, scaling 305m, and what would be the City of London’s tallest building. Standing next to the Gherkin within Square Mile, the designers say the skyscraper would “bring life” to the capital and subject to planning approval, construction on The Tulip could begin in 2020 with completion projected for 2025. In a stark difference to that of neighbouring skyscrapers which offer vast amounts of office space, the proposed latest addition to the capital’s skyline would act as a “new public cultural and tourist attraction” to draw in visitors and schoolchildren to the City. The ambitious proposal which is set to be put forward to the City of London Corporation would measure 305m high – just one metre above the Shard. Billionaire Jacob J Safra is the principle backer of the 2,889m sq project, with planning permission submitted in the name of Bury Street Properties. Those behind the scheme say it “seeks to provide an unparalleled vantage point to view London”, while a key feature will be the education facility within the top of The Tulip, offering 20,000 free places per year for London’s state school children. As well as the main tower, the planning application also includes a new entrance pavilion with public roof terrace, and provision for 284 bicycle parking spaces for staff and visitors.